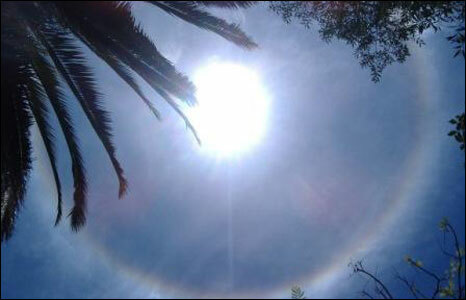 ደጀ ሰላም Deje Selam: Sun halo in Ethiopia: Miracle or Not? The ring of light caused by sunlight refracted by ice crystals hung in the sky for almost an hour before it finally faded and disappeared. Some Ethiopians say it last appeared in 1991 before a military regime fell. "If God reveals himself from the sky," he told a press conference, "we believers do not get surprised. We only rejoice and double our efforts to thank God. Thank you, God, for revealing a sign." But others looked for more secular implications. We are reedemed from our sins not by fasting,but by the blood of jesus christ that was shed on the cross. The blood of jesus christ is the only power that can purifies us from sin. Fasting is the way we humble ourselves to Almighty God. Anonymous ...How is your comment related to the topic?God shows signs in several places as a proof of his presence and good will.Noah dove and dry land ,Jacobs ladder,Elijah's small cloud we can surely say a lot about the signs of God and so why not now it is the same God that let the iron float and the bark to sink.This is a miracle of the Saviour.